I was honored to be invited to deliver the keynote remarks at the UW-Madison Bolz Center’s Arts Business Research Symposium March 13-14. I previewed those remarks here and am posting the full text serially over the next several days. The talk was originally titled “Not about the Benjamins: Arts Entrepreneurship Research, Practice, and Education.” Here’s it’s just called “The Ouroboros.” This is part 6. Music schools have been particularly active in this area. Eastman School of Music sponsors a business plan competition, for example, and Julliard’s music entrepreneurship program has been widely publicized. But there are also programs and courses housed in arts management, arts administration, and arts leadership programs that have been around even longer, and they are teaching arts entrepreneurship across disciplines. Individual courses in arts entrepreneurship or arts business are at well over 100 colleges and universities across the country. I thank Jonathan Gangi, now a graduate student at North Carolina State, for putting together a pretty long list of where arts business education is happening. 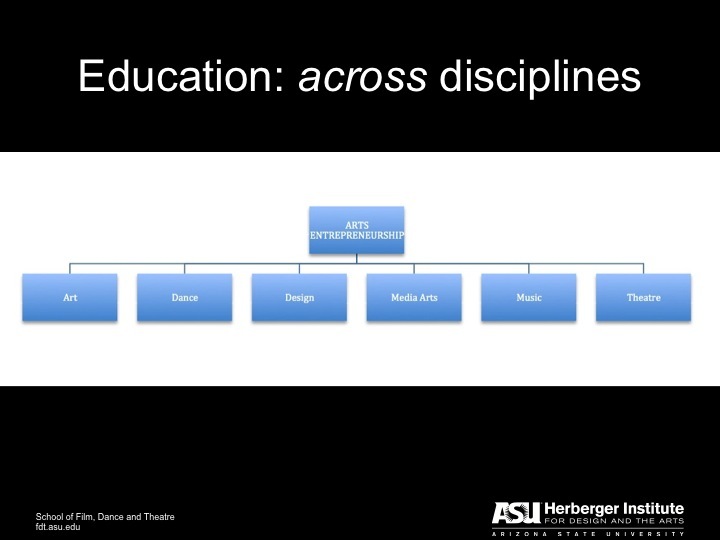 As one might expect, courses and programs within disciplinary departments or conservatories seem to focus on the “entrepreneurial artist” model while those in business schools tend to focus on the “new venture creation” model. The definition of arts entrepreneurship when taught transdisciplinarily in arts schools seems, and this is only my anecdotal observation, to be most broadly construed. As an example, one program I’ve studied, housed in a business school, focuses almost exclusively on business ownership – the content of the art is unimportant – while another, housed in an arts conservatory, focuses instead on “new ways of thinking” about artistic production. The program I lead has a transdisciplinary undergraduate certificate in arts entrepreneurship and then an MFA concentration in Arts Entrepreneurship and Management. 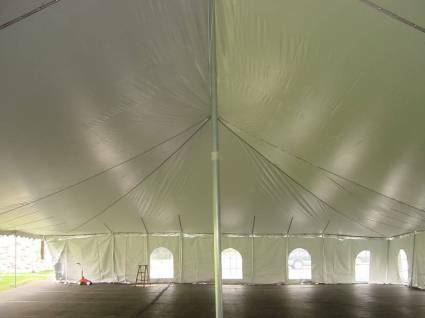 There is a broad range or, as I like to put it, a big tent. As arts entrepreneurship develops as an academic field, care needs to be taken to avoid dividing the field into programs that are nurtured within individual arts disciplines versus programs that cross disciplines. I conceive of arts entrepreneurship and arts business education as a transdiscipline. While arts entrepreneurship and arts business education may be relatively new to academia, it is not new “in the world.” There is A LOT of arts business education that happens outside of the university or academy setting that has been happening for a long time. New York Foundation for the Arts has been offering arts business training since the early 1970s and Creative Capital has done so since its inception in the 1990s. Other organizations like Springboard for the Arts and Art Home mentioned earlier, or the for-profit Institute for Arts Entreprenuership in Chicago also deliver arts business education directly to artists. Some public agencies also provide business training for artists. Montana’s Artrepreneur program is a good example. What is needed as these educational initiatives move forward – especially within academia — is a connection between the research and the education. I had a conversation with a colleague about this recently. He is concentrating his research and research dissemination efforts on arts entrepreneurship in the context of higher education. I reminded him that when he trained for his PhD in musicology, he didn’t study musicology in the higher ed context, but rather he studied musicology. 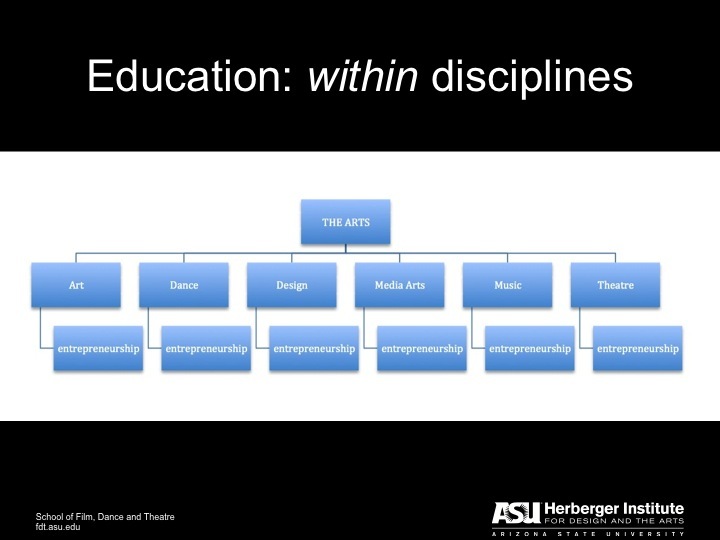 Similarly, if arts entrepreneurship is to move forward in the academy as a discipline of “practice and inquiry” we will need to build up our knowledge of arts entrepreneurship itself so that we are teaching arts entrepreneurship to our students and not merely teaching pedagogy, or teaching people to teach. What are the factors that support entrepreneurial (that is, new venture) success in the arts in the for-profit as well as nonprofit sectors? What entrepreneurial behaviors support success? And how is arts entrepreneurial success measured – financially? Artistically? Next installment (the last): good business practices and the arts. This entry was posted in Arts education, Arts entrepreneurship, arts infrastructure, Higher education and tagged arts entrepreneurship, higher ed, Higher education, Ouroboros. Bookmark the permalink.